or downright enjoyment and exhilarating fun there are few things that will compare with the comic swimming race depicted here with all the graphic powers of an expert snap-shot photographer at his best. 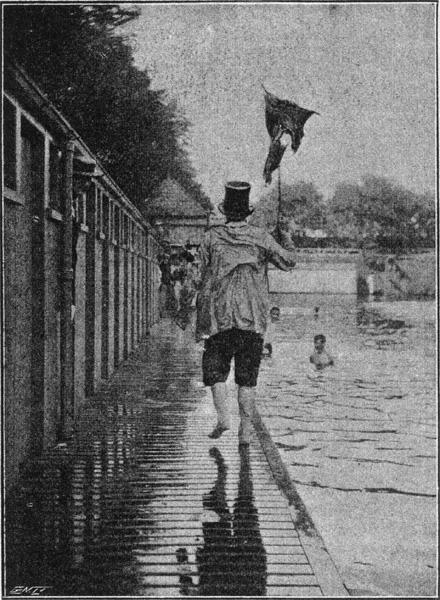 To Mr W Tyrell Biggs, the moving spirit of the Tunbridge Wells “Cygnus” Swimming Club, belongs the fundamental idea of the “top-hat-clothes-and-umbrella-race,” and he very kindly arranged for such a race to take place in order that “STRAND” readers might enjoy the fun from afar, and maybe, organize similar contests for the benefit of local charities or their own personal pleasure. 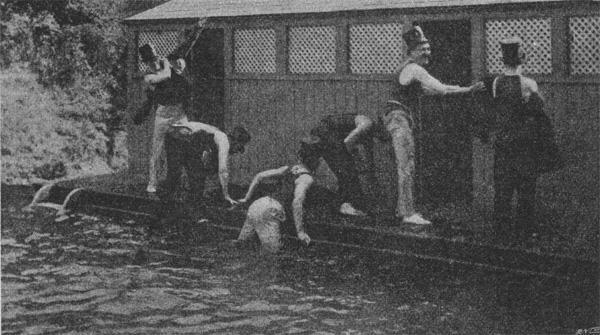 The rules of the game, as laid down by Mr Biggs, are as follows: Competitors start from the deep end of the bath in which the contest takes place and swim to one end where they scramble on to the bank or platform, whichever it may be, and where they have to put on their respective hats. 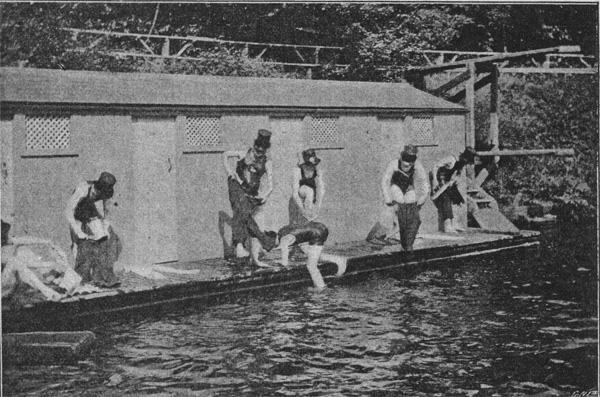 With these on they dive into the water and swim to another side of the bath, where they must select their trousers, which latter have to be put on as securely as the hurried circumstances will allow, when they have to dive in again and swim back to where their hats were formerly, in order to appropriate their respective coats. 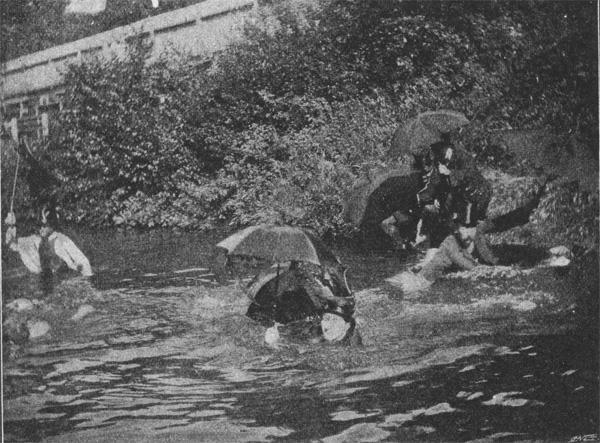 No sooner are these donned then another dive takes place, and competitors are required to swim to a fresh resting-place, where umbrellas are placed in readiness for them. 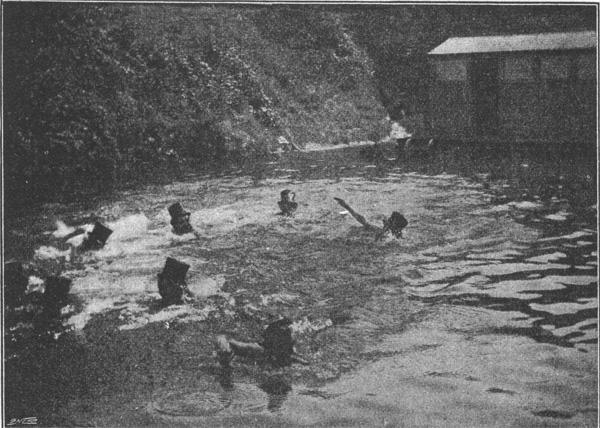 These must be opened, another header must be taken with all accessories complete, and the swimmer who first reaches the shallow end – in this case the final goal – is awarded a prize. 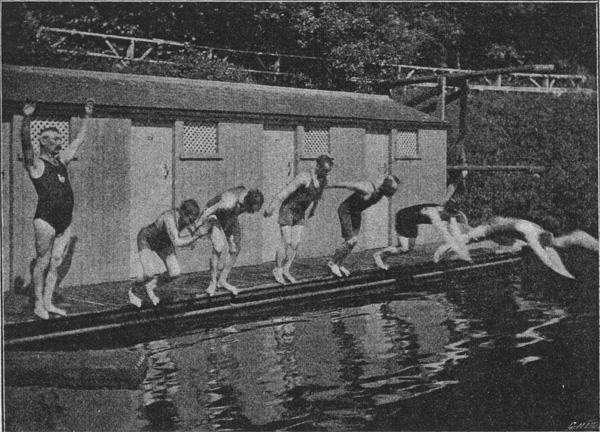 “Competitors are not allowed to use steps, if any exist; they must scramble on to platforms as best they can.” This rule is evidently designed in order to make the race a fair one, as no sufficiency of steps would be found in any bath to allow of all competitors using them at the same time. 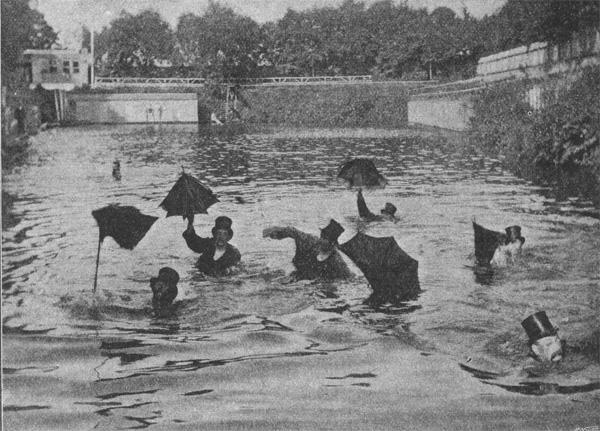 “Umbrellas have to be opened before the last dive takes place, otherwise the users thereof will be disqualified.” This stringent rule, it may be added, generally results in the partial and often total wreck of the poor “gamp,” to the huge merriment of the onlookers. Now that the principal points of the race have been made clear we will proceed to explain the various photos. 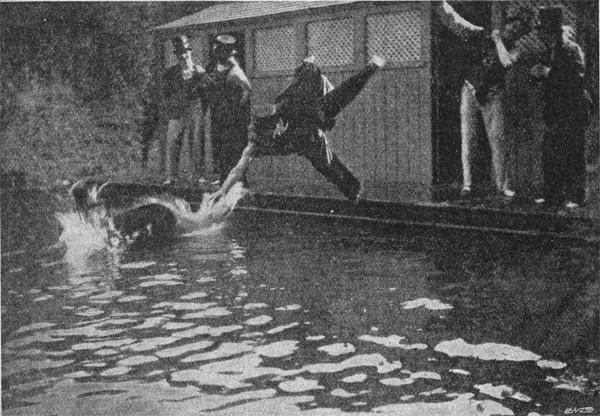 In the first picture on the opening page of this article we have a splendid snap-shot of the first dive. Competitors are dressed in conventional bathing suits only, and they make a dash for dear life, or rather dear hats, at the bank opposite. There is much to be done in the few short minutes that follow, for each and everyone is eager to posses his hat at the very earliest possible moment. A hat is so easy to put on that much may be gained by securing it as soon as possible, so as to give more time for the heavier work of slipping dry clothes upon a wet skin. The scramble for hats is, therefore, a tremendous affair. The coveted objects are plainly discernible almost within arm's reach of eager competitors. Unlike the familiar cry of “hats off,” this is distinctly a case of hats on, hence a quick turn, and a wild dive for the next halting-place. Lo, here floats one hat and there floats another. “Which is mine?” and “Which is the other man's?” Such are the cries heard on every side; it is like a second scramble for hats. The wretched things have such an awkward way of bobbing up and down, and just out of reach, that much bad temper would result were it not for the phenomenal good humour of the competitors. 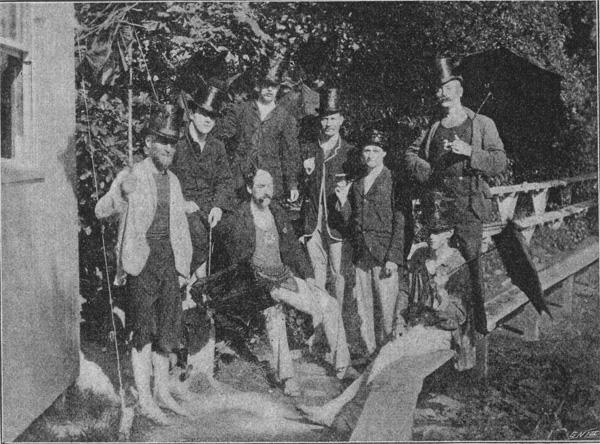 On they plod, hard and panting, and finally the “coat bank” is reached; a scramble, a rush here and a rush there, the wrong garment is snapped up ina twinkling and thrown down again in half the time; the right one is secured – it sticks everywhere, and will not settle down as a decent coat should do. A pull, a stretch, and flop! Another plunge. 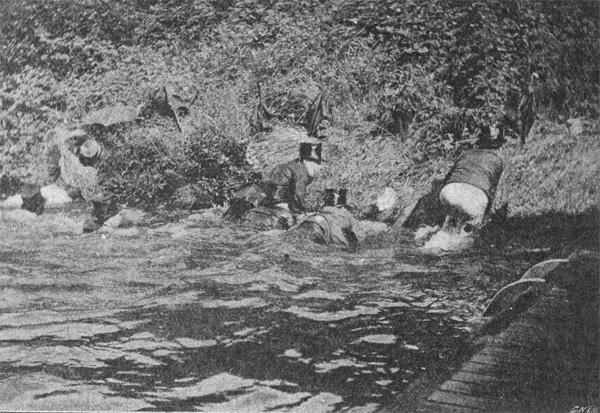 A wild race from the bank ensues; coats grotesquely inflated with air give the swimmers the appearance of tortoises or whales, or other and more mysterious monsters of the deep,and, what is more, they handicap the wearers tremendously; in that case the punishment fits the crime, for had the garments been put on properly, as stated in the rules of the game, progress would have been easier. Here the wild enthusiasm of the crowd knows no bounds; every group has its own favourite; they all expect him to win, of course, and the din of vociferous encouragements is well-nigh deafening. 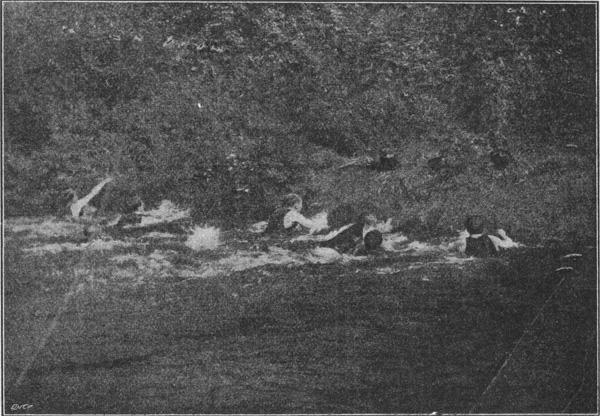 Up scramble the competing swimmers and back they splash into the water, for the bank here is difficult to negotiate. Yet within a yard or two stands the “gamps” unmoved in all their glory, stuck into the soft turf ready for the eager grasp which will wrench them out of their resting-place with scant ceremony. “Open them, open them,” comes from all parts, and there is a reluctant pause, for some of the ancient things are rusty and will not spread as quickly as could be desired. Click, click, click, one after the other they snap and spread wide open, and, then begins the most amusing period of the whole business. If my readers will pause for a moment or so, and imagine themselves diving into a bath with their clothes on and umbrellas opened, they may gain some idea of what the operation is like. By the way, I gathered that there are tricks of the trade in this business as in most, for there are several ways of diving with open umbrellas held aloft: there are the “dropping” process, the “tilting” process, the “let-go” process, the “hold-hard” process, and the “never-care-what-may-happen” process. Several of these interesting processes were used, but they nearly all resulted in havoc, distortion, and in some cases the utter disfigurement, of the umbrellas. In the last picture but one we have the back view of the winner, who is appropriately called the “conquering hero.” His coat has hardly the most fashionable fit, but his hat is well set, while his umbrella is a total wreck, though he has brought it – or rather, what remains of it – safely through its terrible ordeal. The concluding photograph shows a group of our brave competitors “after the race,” and they looked well pleased with themselves. That the spectators of this exciting contest were hugely delighted goes without saying, and we cannot but recommend this amusing pastime to the secretaries of swimming clubs the world over; they in their turn will no doubt have reason to be grateful to Mr Tyrell Biggs for his ingenuity.